Complementing Codons: A Riddle Solved? For some time now, I've been puzzling over a fairly big riddle, and I think an answer is becoming clear. The riddle is: Why, in so many organisms, do codons turn up at a rate approximately equal to the rate of usage of reverse-complement codons? Take a good look at the symmetry of the following graph (of codon usage rates in Frankia alni, a bacterium that causes nitrogen-fixing nodules to appear on the roots of alder plants). Codon usage in Frankia alni. Notice that a given codon's usage corresponds, roughly, to the rate of usage of the corresponding reverse-complement codon. This graph of codon freequencies in F. alni shows the strange correspondence (which I've commented on before) between codons and their reverse complements. If GGC occurs at a high frequency (which it does, in this organism's protein-coding genes), the reverse-complement codon GCC is also high in frequency. If a codon (say TAA) is low, its reverse complement (TTA) is also low. I've seen this relationship in many organisms (hundreds, by now); too often to be by chance. The question is why codons so often occur in direct proportion to the rate of occurrence of corresponding reverse complements. It doesn't make sense. The notion of base pairing should not come into play when an organism (or natural selection) chooses codons, because all of a protein gene's codons are collinear, on one and the same strand of DNA; base-pairing rules do not play a role in choosing codons. I think, in fact, base-pairing does a play a role. The answer is obvious, when you think about it. We know that (single-stranded) RNA, if properly constructed, will fold back on itself to form loops and stems: complementary regions will base-pair with each other. Certainly, if secondary structure in mRNA is widespread, it will have consequences for codon selection. Codons in "stem" regions will complement each other. And so it's fairly obvious, it seems to me, that a reasonable explanation for the riddle of "reverse complement codon selection" is that secondary structure of mRNA (or possibly single-stranded DNA) is far more pervasive than any of us might have suspected. It's pervasive enough to affect codon usage in the way shown in the graph above. Is there any evidence that secondary structure is widespread? I think there is. If you go looking for complementary sequences inside protein-coding genes in F. alni, for example, you find many. As a probe, I had a script check for intragenic complementing length-12 sequences ("12-mers") in all 6,711 protein-coding genes of F. alni. (I presented pseudocode for the script in an earlier post.) Based on the known base-composition stats of the organism, I expected to find 5,440 such 12-mer pairs by chance. What I found was 6,319 such pairs located in 2,689 genes. (When I looked for complementing 13-mers, I expected to find 1,467 occurring by chance, but instead found 3,592 such pairs in 2,086 genes.) In a previous post, I showed similar results for Sorangium cellulosum (a bacterium with an enormous genome). Previous to that, I showed similar results for Mycoplasma genitalium (which has one of the tiniest genomes of any free-living microbe). But do these regions of internal complementarity affect codon choice? Indeed they do. When I looked at the top 40% of F. alni genes in terms of the number of internal complementing 12-mers, I found a Pearson correlation between codons and reverse-complement codons of 0.889. 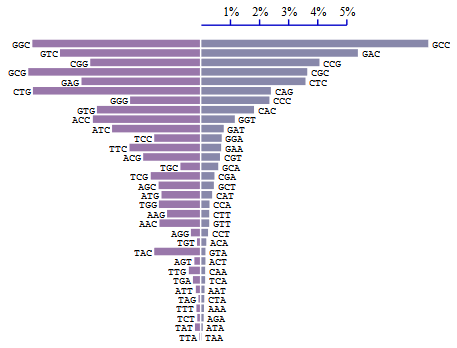 Looking at the bottom 60% of genes, I found the correlation to be lower: 0.766. These numbers, moreover, were virtually unchanged (0.888 and 0.763) when I re-calculated the Pearson coefficients using expectation-adjusted codon frequencies. That is to say, I used base composition stats to "predict" the frequencies of each codon, then I subtracted the predicted number from the actual number, for each codon. (Example: The frequency of occurrence of guanine, in F. alni protein genes, is 0.35794, and the frequency of cytosine is 0.37230, hence the expected frequency of GCC is 0.35794 * 0.37230 * 0.37230, or 0.04961. The actual frequency is 0.07802.) The correlation still existed, practically unchanged, after adjusting for expected rates of occurrence of codons. The bottom line is that the correlation between the frequency of occurrence of a given codon and the frequency of its reverse-complement codon, which is otherwise very hard to explain, is quite readily explained by the presence, in protein-coding genes, of a significant amount of single-strand complementarity (of the type that could be expected to give rise to secondary structure in mRNA). On this basis, it's reasonable to suppose that conserved secondary structure is actually a major driver of codon usage bias. Please show this post to your biogeek friends; thanks! One of the most rudimentary yet most valuable types of statistics you can calculate for two data sets is their correlation value. Two widely used correlation methods are the Pearson method (which is what we normally think of when we think "correlation coefficient"), and the Spearman Rank Coefficient method. Which is which? When would you use one rather than the other? The Pearson method is based on the idea that if Measurement 1 tracks Measurement 2 (whether directly or inversely), you can get some idea of how "linked" they are by calculating Pearson's r (the correlation coefficient), which is a quantity derived from the products of the differences between each M1 and its average and each M2 and its average, duly normalized. The exact formula is here. Rather than talk about the math, I want to talk about the intuitive interpretation. The crucial point is that Pearson's r will be a real value between minus-one and plus-one. Minus-one means the data are negatively correlated, like CEO performance and pay. Okay, that was a lame example. How about age and beauty? No. Wait. That's kind of lame too. How about the mass of a car and its gas mileage? One goes up, the other goes down. That's negative correlation. The statistical significance of a correlation depends on the magnitude of the correlation and the number of data points used in its computation. To get an idea of how that works, play around with this calculator. Basically, a low correlation value can still be highly significant if there are enough data points. That's the main idea. Spearman's rank coefficient is similar to Pearson in producing a value from -1 to +1, but you would use Spearman (instead of Pearson) when the rank order of the data are important in some way. Let's consider a couple of examples. A hundred people take a standardized test (like the SAT or GRE), producing 100 English scores and 100 Math scores. You want to know if one is correlated with the other. Pearson's method is the natural choice. But say you hold a wine-tasting party and you have guests rate ten wines on a decimal scale from zero to ten. You want to know how the judges' scores correlate with the wines' prices. Is the best-tasting wine the most expensive wine? Is the second-best-tasting wine the second-most-expensive? Etc. This is a situation calling for Spearman rather than Pearson. It's perfectly okay to use Pearson here, but you might not be as satisfied with the result. In the Spearman test, you would sort the judges' scores to obtain a rank ordering of wines by the "taste test." Then you would calculate scores using the Spearman formula, which values co-rankings rather than covariances per se. Here's the intuitive explanation: Say the most expensive wine costs 200 times more than the cheapest wine. Is it reasonable to expect that the most expensive wine will taste 200 times better than the cheapest wine? Will people score the best wine '10' and the worst wine '0.05'? Probably not. What you're interested in is whether the taste rankings track price in an orderly way. That's what Spearman is designed to find out. If the taste scores are [10,9.8,8,7.8,7.7,7,6,5,4,2] and the wine prices are [200,44,32,24,22,17,15,12,8,4], the Spearman coefficient (calculator here) will be 1.0, because the taste scores (in rank order) exactly tracked the prices, whereas Pearson's r (calculator here) will be 0.613, because the taste scores didn't vary in magnitude the same way that the prices did. But say the most expensive wine comes in 4th place for taste. In other words, the second array is [44,32,24,200,22,17,15,12,8,4] but the first array is unchanged. Now Spearman gives 0.927 whereas Pearson gives 0.333. The Spearman score achieves statistical significance (p<.001) whereas Pearson does not. There are plenty of caveats behind each method, which you can and should read up on at Wikipedia or elsewhere. But the main intuition is that if rank order is important for your data, consider Spearman. Otherwise Pearson will probably suffice.